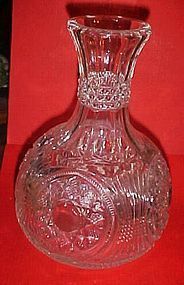 Starred Loop water decanter George Duncan Starred Loop Water Carafe Clear EAPG 8 1/4" T; 5 1/2" Widest. Produced ca 1900. No signature or label. Shows very minor wear for its age condition is excellent - no chips, cracks, or cloudiness. Typical Pontil scar on the bottom.